I watched the 2014 CrossFit Games this morning and saw Camille Leblanc-Bazinet and Rich Froning win their respective titles. I enjoyed watching it and was in awe at some of the challenges they completed. At the same time, watching the Games highlighted some of the limitations of CrossFit in my opinion. CrossFit is a legitimate sport, and has millions of followers worldwide. The CrossFit Games was shown live on TV around the world, and people lap up the contest and the competitors. The athletes are an impressive mix of strength, speed, endurance and skill. Some are specialists in certain areas, while others are good all-round athletes. The winner of the CrossFit Games is crowned the "Fittest on Earth" (which I'm sure other sports might debate). The people who say this are often going to the gym just to look better, which I'm not sure is a real sport either! Many people love CrossFit, and it seems that just as many love to hate it. The sometimes dubious form, the crazy founder and the centralised concept have been bones of contention with many in the fitness industry over time. Watching the games this morning made me consider my views, both as an individual and fitness/nutrition consultant. CrossFit is not a training system I would personally use, but this doesn’t mean I can't see it's value. I like to plan my own training to test out new principles and chase progression. Completing a WOD 4-5 times a week would be fairly energy sapping for me, and doubt I would want to add too much additional training, which makes it hard to do your own thing. I also don’t like burpees, which means I won’t be joining a CrossFit Box anytime soon. As a fitness consultant, I can see both the benefits and negatives of CrossFit. 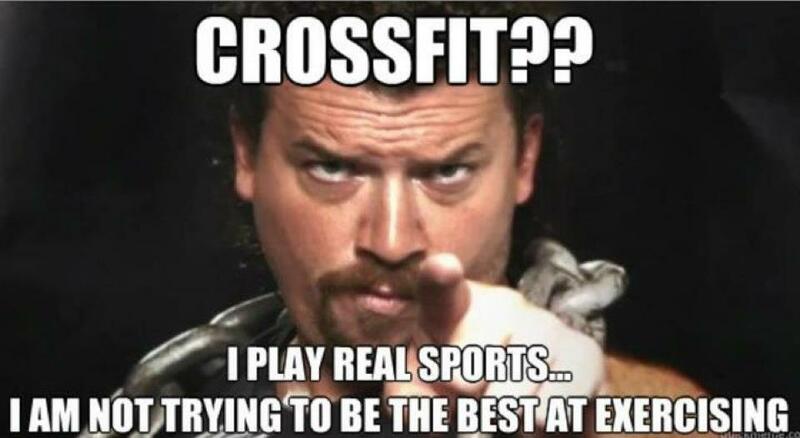 Many people argue about CrossFit vs Bodybuilding and which is better, but I think it’s time to move on from this petty debate. Even though both involves lifting weights, they are completely different sports which have very different requirements. It is a wasted argument anyway as CrossFit has some great physiques and bodybuilding has some impressive athletes. Most people arguing just want to criticise the other sport anyway, instead of having a proper discussion.. So let me take a more objective view of CrossFit and what I think it does well and what can be improved. What I like about CrossFit. CrossFit has a great community surrounding it. This appears to be very supportive, and people tend to thrive in this environment, which can promote adherence. Just look at the crowd at the CrossFit Games and there are tonnes of support crews from each CrossFit Box that make the journey to support their athletes and the sport. Everyone in the crowd can also relate to what the athletes are doing, as they have usually completed the same workouts themselves! Camille Leblanc-Bazinet - 2014 CrossFit Games Winner. (Source: games.crossfit.com). CrossFit is a system that people engage in and are passionate about. The constantly changing workouts, a range of elite athletes and the competitive nature of CrossFit are all aspects that promote adherence to training. Going to the gym and doing the same program can be boring (obviously not my programs), which quickly lead to people dropping out of training and often with that goes good nutrition. I don't know exact figures on the retention rate of CrossFit, but from anecdotal reports it seems they are quite good. What isn’t ideal about CrossFit. The programming and layout of some workouts can be dangerous. While I like the use of technical and complex lifts being taught to. The biggest issue is completing exercises for time. This promotes the rushing and execution of complex and technical movements under fatigue, which can lead to technique breakdown and potential injury. In the second-last event today, athletes completed four thick-rope climbs followed by three 100kg overhead squats. A few athletes dominated the event, but quite a few really struggled to complete the overhead squats after the climbs. It was a feat to see, but I question the placement of 100kg overhead squats (very complex movement) while under heavy fatigue, but I guess that is part of CrossFit's allure. Now this can vary a lot. There are some athletes who practice incredible form, and they have nothing to be worry about. However, there are also some horrific examples of form I have seen. Now it is foolish to say that bad form is limited to Crossfit only. There are plenty of bodybuilders or weekend gym warriors using horrific form every day of the week. However, when Crossfit prescribes complex whole body exercises and movements, there is a need for strict enforcement of technical parameters. A poorly performed bicep curl might hurt your gains, but a single (or repeated) poorly performed clean and jerk can hurt a whole lot more! Need a spot bro? ( Source:crossfitwilmington.com). The Level 1 CrossFit accreditation is a weekend course, which Crossfit.com states “provide attendees an initial and foundational education to begin training others using Crossfit.” I think that 6-week personal training courses aren’t long enough to develop knowledge of exercise technique and training, let alone just two days! Accreditation has does not necessarily impact on a coach's ability, and there are many great coaches with basic qualifications. The problem is that these systems generally do not eliminate bad coaches, and often now give them a new accreditation to promote their poor views and uneducated beliefs. This is what needs to be eradicated, and a focus towards better coaching via stronger accreditation. CrossFit is a genuine sport and is here to stay. When well implemented, I think that CrossFit is an awesome exercise system that has numerous benefits. The issues that CrossFit face (and are often criticised for) are the same issues that are rife in the fitness industry, such as poor form and accreditation systems. Would CrossFit be the workout system I suggest for every client aiming for body recomposition? No. However, I might recommend CrossFit to client from sporting backgrounds looking for a new challenge. This way, I can provide an objective view on their CrossFit training and looking to optimise it. I can also put in place nutrition protocols that help them achieve their performance and body composition goals! A lot better than cleaning your house.